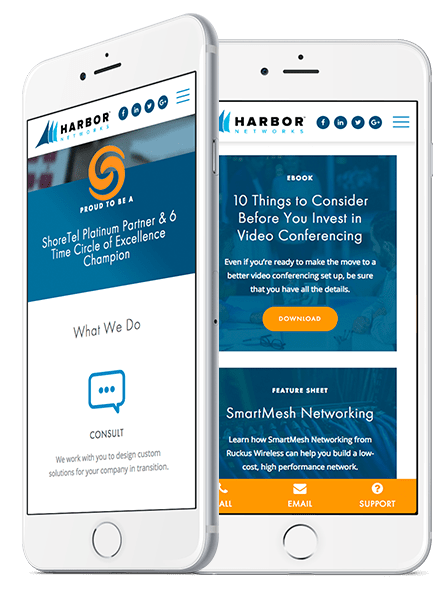 Harbor Networks came to us with a clear goal in mind: create a simple, easy-to-use website that was easy for site visitors to navigate to get the information they need. They also wanted to implement a chat and support feature to make it simple and easy for their users to contact them. After digging in and creating a strategy, we found that Harbor Networks had a lot of good content but it was just not organized in a user-friendly way. So, we set out to create a new site map that would be easy-to-use and make sense. We kept the design simple, clean, and focused on the helpful features for users like the mobile footer menu that allows them to contact Harbor Networks with a push of a button.